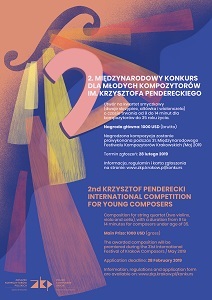 On March 11, 2019, the Jury of the Second Krzysztof Penderecki International Competition for Young Composers in Krakow selected the winners of the competition. 37 scores from Armenia, Austria, Chile, China, Germany, the Czech Republic, the Netherlands, Hong Kong, Canada, Israel, South Korea, Poland, Slovakia, USA, Great Britain and Italy were submitted, 5 of which were rejected due to non-compliance with rules. 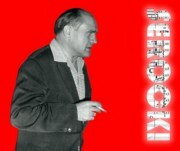 The jury was composed of: Marcel Chyrzyński (chairman), Zbigniew Bargielski, Ivan Buffa (Slovakia), Justyna Duda-Krane (Quartet Dafo) and Wojciech Widłak. The secretary of the Contest was Aleksandra Patalas. The jury, after reviewing 32 scores, decided to award the Main Prize in the amount of USD 1,000 to Szepty (Emblem: 500.K53). In addition, the Jury decided to award three honorable distinctions for the works: Interpolations (Emblem: 211289), De profundis (Emblem: bz # 2205) and San-Guei (Emblem: CSC9). After opening the envelopes, it turned out that the winner of the Main Prize is Olgierd Juzala-Deprati from Poland.  Among the distinguished composers there are Otto Wanke from Austria (Emblem: 211289), Andrzej Ojczenasz from Poland (Emblem: bz # 2205) and Xinyang Wang from China (Emblem: CSC9). The official reading of the protocol and the premiere of the winner's work will take place during the concert on May 15, 2019 at 7.00 p.m. in the "Florianka" Auditorium of the Academy of Music in Krakow. 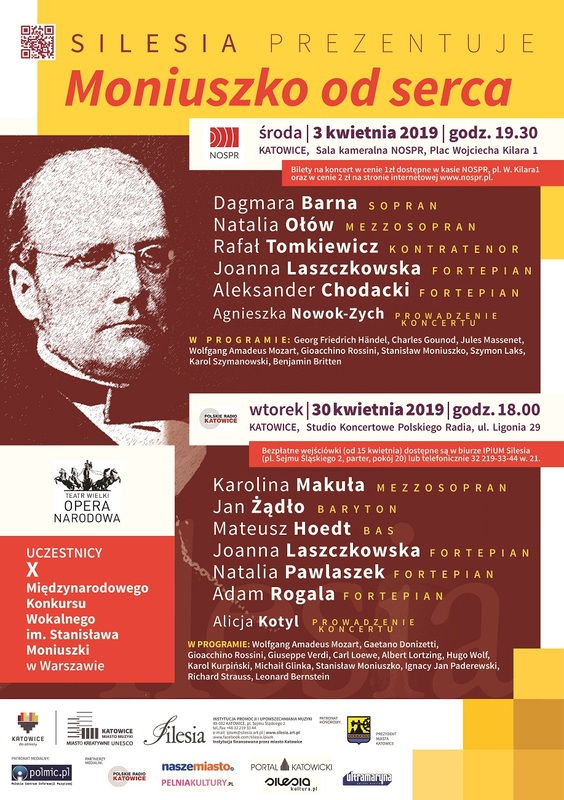 The concert will take place as part of the 31st International Festival of Krakow Composers, and the award-winning work will be performed by the Dafo String Quartet from Poland. A unique concert inaugurating a series of events to commemorate the 120th birth anniversary of the outstanding composer Jan Adam Maklakiewicz will take place on April 7, 2019 at 6:00 p.m. in the Great Hall of the Zamek Cultur Center in Poznań. 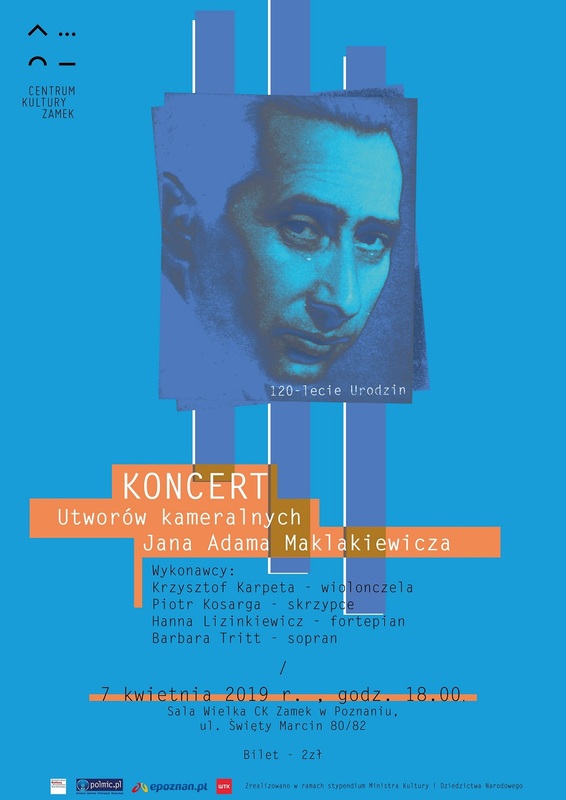 The main aim of the celebrations is to restore the memory of Jan Adam Maklakiewicz (1899-1954) – Polish musician, composer, teacher, recognised publicist and organizer of musical life. The concert will feature his valuable, yet unknown solo and chamber compositions: Reflexions, Op. 14, Hutsul Suite, Op. 15 No. 1 for violin and piano, Triptych Spring in the Village, Op. 18, Ave Maria for cello and piano, as well as selected songs: I zniknę z oczu Wam jak ptak, a cycle of Four Japanese songs, Op. 25, Na kochanie nie masz rady, Lullaby for soprano and piano. 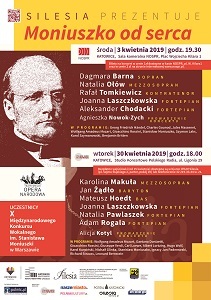 The works will be performed by graduates and pedagogues of music academies in Poznań and Wrocław: cellist Krzysztof Karpeta, violinist Piotr Kosarga, pianist Hanna Lizinkiewicz and soprano Barbara Tritt. 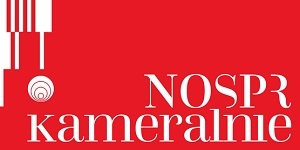 Aleksander Tansman's music will be performed in the cycle "NOSPR chamber music" on April 4, 2019 at 7:30 p.m. in the Polish National Symphony Orchestra Concert Hall in Katowice. The programme of the concert will inclulde Suite for bassoon and piano by Aleksander Tansman, Suite for violin, clarinet and piano by Darius Milhaud, Pastorale for flute and piano by Germaine Tailleferre, Fantasy for flute and cello 'Assobio a Jato' ('The Jet Whistle') by Heitor Villa-Lobos, and Suite 'La revue de cuisine' ('The Kitchen Review') from the ballet Pokušení svatoušká hrnec (Temptation of the Saintly Pot) by Bohuslav Martinů. The Warsaw premiere of the latest album by Marzena Majcher Chemistry of Love (Requiem Records – Opus Series) will take place on 4 April 2019 at 8:00 p.m. at the DZiK club. 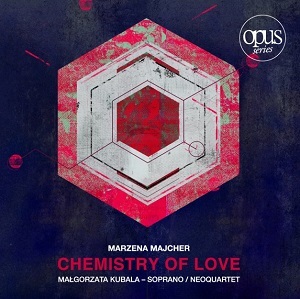 Chemistry of Love is a cycle of works for soprano and string quartet by Marzena Majcher – a composer of contemporary classical and film music, who is considered to be one of the most interesting artists involved in projects comprising music and science. Her latest interdisciplinary album is based on an original concept of finding analogies between music and chemistry. The structure of music is inspired by the patterns of chemicals (such as phenylethylamine or dopamine) responsible for the state of falling in love, colloquially called the "chemistry of love". The most importan part of this experiment was to find harmony, melody and the source of emotion in these patterns. Chemistry of Love is already known to audiences of music festivals in Poland and abroad. It was performed at the Music Festival Ecos Urbanos in Mexico (Mexico City, 2017), 14th International Festival of Contemporary Music and Visual Arts (Bydgoszcz, 2018), and in the Planetarium of the Copernicus Science Institute (Warsaw, 2017). Małgorzata Kubala, an electrifying soprano, and NeoQuartet, one of the most active Polish ensembles specializing in contemporary music, will premiere the album in Warsaw withvisualization by Andrzej Wojciechowski. A musical storm of emotions awaits the Elbląg music lovers on April 4, 2019 at 7:00 p.m. in the Concert Hall of the State Music School Complex in Elbląg. Elbląg chamber musicians and Yibai Chen – 3rd prize winner of the International Witold Lutosławski Cello Competition – will convince the audience that there are no emotions that cannot be expressed in the language of string instruments. They will present works by Wolfgang Amadeus Mozart (Divertimento in F major KV138), Joseph Haydn (Celllo Concerto in C major), Dmitry Shostakovich (Symphony in C minor, Op. 110a), and Romuald Twardowski (Oberek for string orchestra) under the baton of one of the most talented young Polish conductors, Szymon Stec. The concert is held under the patronage of the PWM Edition as part of the TUTTI.pl project promoting the performances of Polish music. 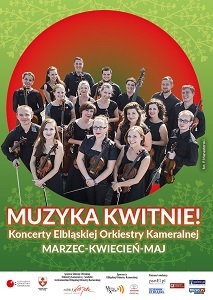 The Świętokrzyska Philharmonic invites you on 3-12 April 2019 for the 27th edition of the Świętokrzyskie Days of Music Festival, featuring ten different concerts presenting different musical styles. Since 2002, Jacek Rogala has been managing the Świętokrzyskie Days of Music which aim is to present Polish music, with particular emphasis on works not previously performed in Kielce. This year, on the occasion of Grażyna Bacewicz's 110th birth and 50th death anniversaries, we will listen to her Symphony No. 3 and Concerto for piano and orchestra performed by dr hab. Cezary Sanecki, rector of the Academy of Music in Łódź, and the Symphony Orchestra of the Świętokrzyska Philharmonic. 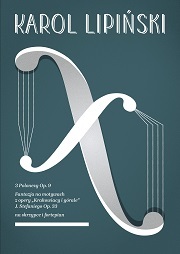 The programme of the festival will also include compositions by Grażyna Pstrokońska-Nawratil, Eugeniusz Knapik, Jerzy Kornowicz, Paweł Szymański, Ewa Fabiańska-Jelińska, Weronika Ratusińska-Zamuszko, Marek Pasieczny, Łukasz Woś, Paweł Mykietyn, Jacek Urbaniak, and Krzysztof Owczynik. 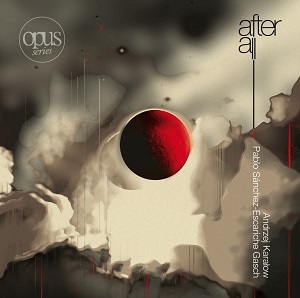 They will be performed by excellent Polish musicians: flutists Agata Kielar-Długosz and Łukasz Długosz, pianist Adam Kosmieja, cellist Michał Pepol, the Six & Sax Duo, and the Ars Nova ensemble. The programme of the Festival will also include a jazz evening and a family concert during which the youngest music lovers will learn about the "giants" of 20th century music, such as Witold Lutosławski or Henryk Mikołaj Górecki, in the form of interactive play. 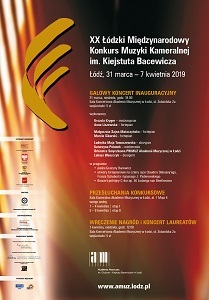 The Institution for the Promotion and Dissemination of Music "Silesia" invites you to concerts of participants of the 10th International Stanisław Moniuszko Vocal Competition, which will take place on April 3 at 7.30 p.m. at the Polish National Radio Symphony Orchestra Concert Hall in Katowice and April 30, 2019 at 6.00 p.m. in the Radio Katowice Concert Studio. Thanks to the cooperation of the "Silesia" Institution with the Grand Theater – National Opera in Warsaw, young vocalists who qualified for the 10th International Stanisław Moniuszko Vocal Competition will sing in Katowice before the competition. The Competition Office received 378 applications from over 50 countries, out of which the Admissions Committee selected 88 vocalists to the Competition. Its jubilee edition will take place on May 5-11 this year and will be combined with the celebration of the 200th birth anniversary of its Patron. 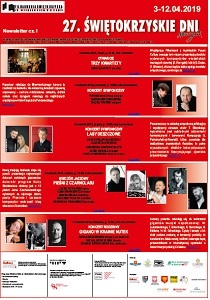 In Katowice, six vocalists will perform in concert cycles "Moniuszko from the heart" and "The Youth's Wednesday". In the first concert, selected works from the competition repertoire will be presented by graduates of the Fryderyk Chopin University of Music in Warsaw and participants of the Opera Academy of the Grand Theater – Polish National Opera. In reference to the competition regulations, the programme will be composed of works by Stanisław Moniuszko, Karol Szymanowski, Szymon Laks and arias from world vocal literature. 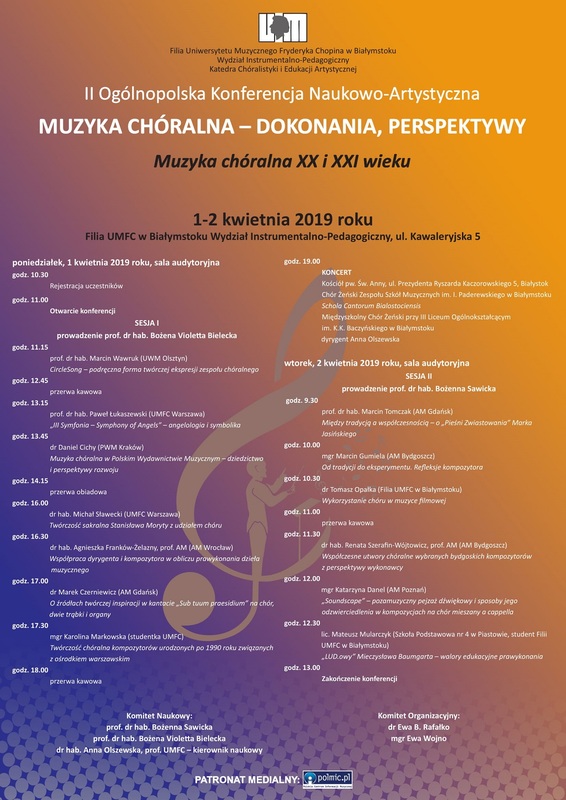 The Chair of Choir Studies and Artistic Education of the Department of Instrumental and Educational Studies at the Fryderyk Chopin University of Music invites you to participate in the 2nd National Science and Art Conference "Choir music – achievements, perspectives. 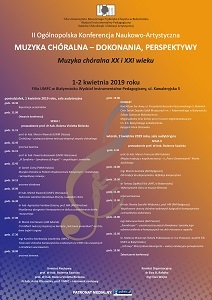 Choir music of the 20th and 21st centuries", which will take place in Białystok on April 1-2, 2019. 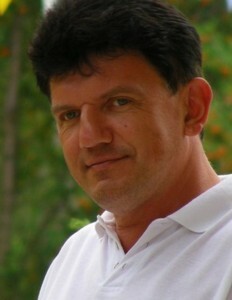 The Scientific Committee of the Conference consists of: prof. zw. dr hab. Bożenna Sawicka, prof. zw. dr hab. Violetta Bielecka and dr hab. Anna Olszewska, prof. FCUM. Invitation to participate in the conference was accepted by conductors, choirmasters, musicologists, theoreticians and composers, including prof. dr hab. Paweł Łukaszewski, dr hab. 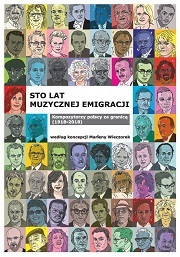 Michał Sławecki, dr. Daniel Cichy, dr Tomasz Opałka, Katarzyna Danel and Marcin Gumiela. As part of the Conference, a concert of choral music will take place on April 1 at 7.00 p.m. in the Saint Anna Church in Białystok. The Female Choir of the I. J. Paderewski Music Schools Complex "Schola Cantorum Bialostociensis" and the Intrascholastic Female Choir at the K. K. Baczyński General Upper Secondary School in Białystok conducted by Anna Olszewska will perform works by Tadeusz Szeligowski, Stanisław Moryto, Marcin Łukaszewski and Marek Raczyński. In addition, the premieres of works by Michał Sławecki, Marcin Gumiela and Katarzyna Danel will take place. 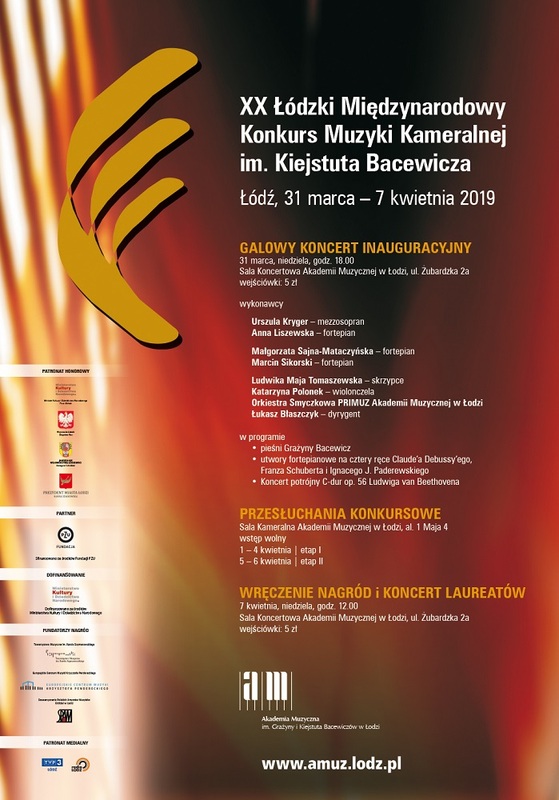 A concert by outstanding Polish chamber musicians will inaugurate the 20th Lodz International Kiejstut Bacewicz Competition for Chamber Music on March 31, 2019 at 6.00 p.m. in the Concert Hall of the Music Academy in Lodz. The programme of the inaugural concert will consist of piano works for four hands. Małgorzata Sajna-Mataczyńska and Marcin Sikorski from the Academy of Music in Poznań will present a selection of pieces from Ignacy Jan Paderewski's Tatra Album, Op. 12, Claude Debussy's Petite Suite and Franz Schubert's Fantasy in F minor. Mezzosoprano Urszula Kryger accompanied on piano by Anna Liszewska will perform a few songs by Grażyna Bacewicz (Mów do mnie o miły, Rozstanie, Smuga cienia). In the finale, we will listen to Ludwig van Beethoven's Triple Concerto in C major, Op. 56. The solo parts will be performed by: violinist Ludwika Maja Tomaszewska, cellist Katarzyna Polonek and pianist Marcin Sikorski. The String Orchestra PRIMUZ of the Music Academy in Lodz (complemented by percussion instruments) will be conducted by Łukasz Błaszczyk. The competition auditions will start on April 1. 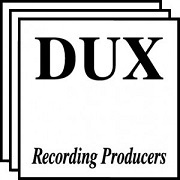 Over 150 young chamber musicians will perform in duets, trios, quartets and quintets. These are teams from Poland and 21 other countries. The artists compete for cash prizes, the highest of which is PLN 8,000 for each member of the winning team, as well as additional awards for performing Polish music, including compositions by Grażyna Bacewicz. The results of the competition will be announced on April 6 at 8.00 p.m. The award ceremony and the concert of the laureates will take place the next day at 12.00 p.m. in the Concert Hall of the Music Academy in Lodz. Poznań | Premiere of Jerzy Fryderyk Wojciechowski's opera "Ofelia"
Katowice | The 8th Festival of Premieres "Polish Modern Music"
Poznań | 48th Contemporary Music Festival "Poznań Music Spring"